This tutorial introduces you to MarketBrowser's Conditional Analytics. Conditional Analytics allow you to define thresholds or conditions and then allows you to use these conditions to build sophisticated analytics. A simple example: you can easily mark a chart with every area where its value exceeds a number you define. Or, alternatively, you can show each spot where that stock price crosses that threshold. How do Conditional Analytics™ Make My Life Better? You can get into much more sophisticated analysis by using Conditional Analytics to explore hypotheticals. Below is a relatively simple step-by-step example. We use Conditional Analytics™ to back-test a basic mean reversion strategy. We create buy/sell conditions based on a MarketBrowser AE technical study (the volatility index). Then we generate a series of extrapolations based on hypothetical buys & sells triggered when .GOOG crosses a condition. Watch how profits are instantly calculated as we apply the trade rule to Google's stock price. Full Display (above): Here, we have completed a back-test for a potential trade strategy. Below are window-by-window zoomed images with detailed explanations for building this analysis. W1 (above) - Google Volatility: Here we've charted Google's Stock Price in green and then over-layed its volatility index (with a boxcar of 6) as the cyan line below it. W2 (above) - Selling Rule: In this example we sell on days when the current price is greater than yesterday's price plus half of the volatility index. In Window 2 we mark days that fulfill this condition. W3 (above) - Buying Rule: Here we've charted our buy signals - in this case we buy on days when the current price is less than yesterday's price minus half of the volatility index. W4 (above) - Trade Profits: Now things are getting interesting! 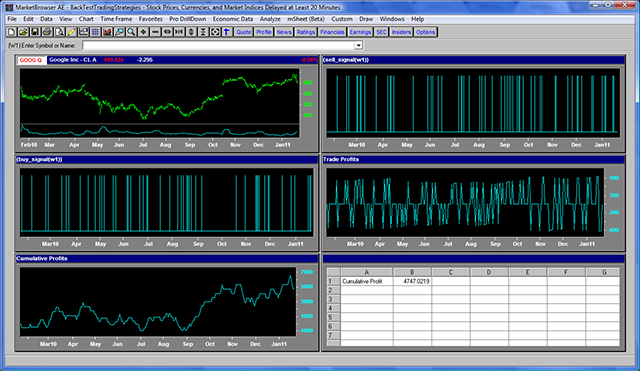 Window 4 pulls & charts the profits and losses for each individual trade conditionally triggered by signals in windows 2 & 3. W5 (above) - Cumulative Profits: Here's the payoff. In Window 5 we total the results calculated in window 4 to display the cumulative profit and losses resulting from our potential trade strategy. W6 (above) - mSheet™ Investment Scorebox: Here we're using MarketBrowser AE's mSheet™ to pull a live result number from Window 5 ($4747 cumulative profit!). This number will update as data changes. And although we're pulling only 1 number here, mSheet can hold hundreds of live stats at a time! Final Result (above): Presto! It took a few minutes to build each of those windows, but now you've got a fully developed analysis above! Save it as a worksheet for future use, or change the stock in W1 to view the strategy applied to different stocks!